This probably isn’t going to work up much of a sweat, but who wants to sweat when there’s dating involved? Not moi. Dating website Doingsomething have once again surpassed themselves with a dating idea to top even their best ideas. Since their launch DoingSomething has taken over the London Eye, given us dating loo tours, dating yoga and even created an Ice Bar complete with igloo at the top of The Shard. But now you have the chance of a lifetime to beat a boy at a game of ping pong, and in front of his mates! 300 guys, 300 girls – all on one mass date, with balls flying around (pun intended) – what’s not to love? Doingsomething have teamed up with Bounce for one night only – hoping to help us go from singles into doubles (see what I did there?!). 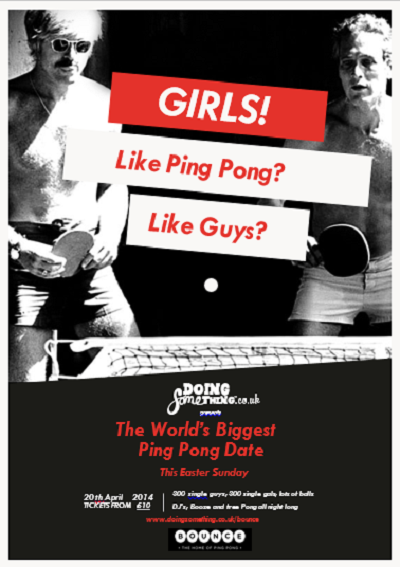 I’ll be there attempting not to injure anyone and of course trying to bag myself a date with a ping pong champ…. Tickets are only a tenner and include a month free on their website – so go buy yours now – here.